When you live or own Western North Carolina Real Estate in an area that is close to the scenic highway, such as The Blue Ridge Parkway, you will enjoy easy access to some of the most beloved outdoor activities. Living or owning Western North Carolina Mountain Property just near The Blue Ridge Parkway will give you not only the best views of the majestic peaks and valleys in the Blue Ridge Mountains, but also a unique mountain lifestyle that most people only get to dream about. Both active people and those seeking peace and solitude love living and owning real estate near the world renowned Parkway. Read and learn more about some of the fantastic activities that people enjoy when they own real estate in the High Country. The Blue Ridge Parkway is filled with the best spots to hike, backpack and even camp. Numerous overlooks and parkway rest areas have hiking trails that lead away from the main area, and many of them have amenities for camping. A lot of the hiking trails on the Blue Ridge Parkway in Boone lead to stunning views or even special places like waterfalls! Make sure to stay on trails and follow the trail heads. Venturing away from the trails is dangerous. 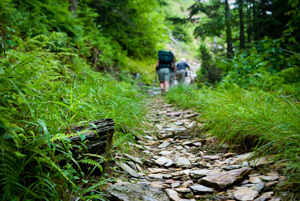 There are trails for everyone including beginners, intermediate level hikers, and experts. Blue Ridge ParkwayLance Armstrong once visited the High Country area and decided upon the back country, steep, mountain roads of The Blue Ridge Parkway as his training ground after coming back to the sport of cycling in 1998. There are numerous cycling groups in the area and mountain biking is very popular here. The winding curves and steep inclines found on the Parkway will help any mountain biker step up his or her game! With Stone Mountain State Park and areas like the Linville Gorge Wilderness area just a short distance away from all of the great areas of the High Country, rock climbers have been making the trek to Stone Mountain and the rock climbing areas that are found in the Linville Gorge for decades. Recently, Boone was recognized by a well-known climbing magazine as one of the Top 10 places to live if you enjoy climbing and bouldering. The Blue Ridge Mountains and the parkway are known for their abundance of Western North Carolina Horse Property, and, as a result, you can rest assured that there are numerous trails and hideaways where you can go horseback riding. Some of the best, awe-inspiring spots are not accessible by a motor vehicle, but you can definitely horseback ride to get there! Even if you are not a seasoned rider, you can enjoy the trails. There are numerous stable companies in the area that offer boarding, lessons and timed trail rides through the Blue Ridge and near Moses Cone Manor on the Blue Ridge Parkway in Blowing Rock. Streams and mountain brooks flow from ancient rivers like The New River, The Watauga River and Little River and have created some excellent fishing holes on The Blue Ridge Parkway in our area. For decades, avid fishermen have been coming to this location in the High Country to fish for trophy trout, bass and other wild mountain varieties that you simply will not see off of the mountain. Many people enjoy the fishing around the mountain property that they buy here. The same rivers that are perfect for fishing are great for a leisurely canoe ride, and there are even a few high impact areas where kayaking and whitewater rafting is easy to do. The New River is calm and probably the best for lazy tubing and canoeing while the Watauga River is better suited for thrills. Interested in real estate near lands that border the Blue Ridge Parkway? I list and sell Mountain Property in North Carolina in one of the most desirable places in the Appalachian Mountains. Read more to find out about other great things about the Blue Ridge Parkway and start looking for your dream home today by browsing my listings.